It has been about 12 years since I last updated this webpage, so it is time to catch up. A lot has happened in the last dozen years. 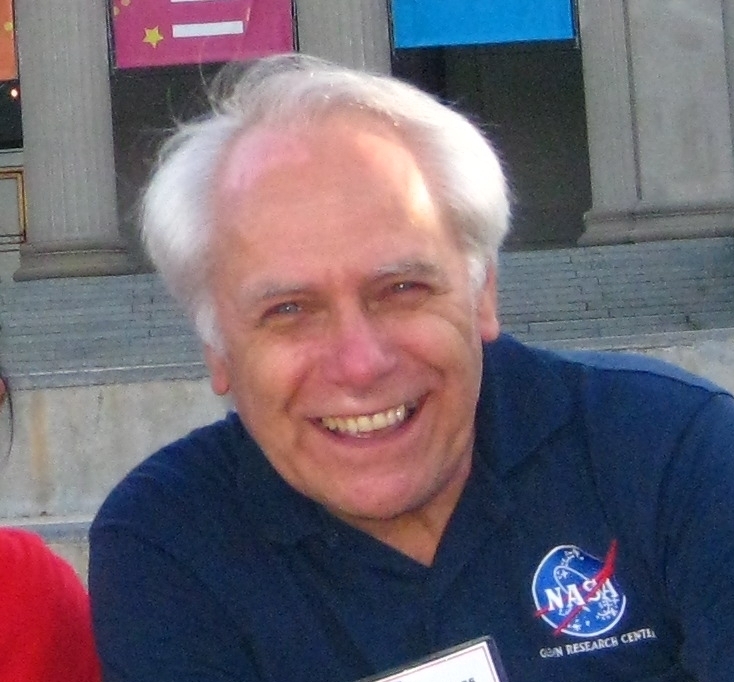 I have been an aeronautical engineer now for more than 40 years and have worked at the NASA Glenn Research Center in Cleveland, Ohio, for more than 30 of those years. I have had the pleasure of working with many interesting people on challenging fluid mechanics problems. For the last 15 years I have been developing interactive software and a large educational website to help students learn about math and science. I also particpate in videoconferencing with both teachers and students as part of NASA's Digital Learning Network. I was born and grew up in Columbus, Ohio. My engineering career began with an interest in airplanes and space flight when I was in grade school in the 1950's. During my childhood, I read science fiction stories and watched sci-fi movies. My brother and I built and flew paper airplanes, kites, wooden gliders, rubberband-powered aircraft and model rockets. In high school, I was pretty good at math, science, and reading (English) and as a 10th grade science fair project, I built a very simple, manually-switched computer that always beat the user at Tic-Tac-Toe. Computers were relatively new at that time, and the experience taught me a great deal about computers. In 1965 I entered Ohio State University to major in electrical engineering, but quickly switched to aeronautical engineering as NASA's Gemini and Apollo programs picked up steam. I enjoyed learning about airplanes and spacecraft, enjoyed solving problems, and could get paid to work with airplanes. So that was my career choice. College seemed to go by very quickly, and there was so much to learn besides aerodynamics. I really enjoyed art, literature, and music courses along with the boundary layer theory, thermodynamics, and calculus. I graduated in 1971 with Bachelor's and Master's of Science Degrees in Aeronautical and Astronautical Engineering. As a master's student, I studied how blood flows through the circulatory system of the body. My thesis project was a computational model of the flow in the capillaries (the smallest blood vessels in the body). My plans were to keep going to college to get a Ph.D., but I was drafted into the military towards the end of the Vietnam war. From 1971 to 1975 I served as an enlisted man in the United States Air Force at Wright-Patterson AFB in Dayton, Ohio. Because I had a college degree, I was able to work as an engineer in the Inlet Aerodynamics group of the Aeronautical Systems Division. The inlet is the part of the aircraft that brings air into the propulsion system. It was a very busy and exciting time. I participated in the wind tunnel testing and performance assessment for the inlets on the B1-A, F-16, and YF-17 (later to become the Navy F-18). I was also on the source selection team for the Air Combat Fighter (F-16) and the EF-111 and was involved in performance predictions of the F5-E and Airborne Command Post (later to become the 747 version of Air Force 1). I even participated in flight tests on the IR-suppression system of the AC-130 gunship. When my military service time ended, I returned to Ohio State to work on the Ph.D. After more classwork on the computational modeling of fluid flows I passed my general exams. But I was getting tired of the college life and had a wife and two kids, so I decided to get a "real job". In 1978, I applied to NASA and landed a job at the NASA Lewis Research Center (now called NASA Glenn). I planned to finish my dissertation while working at NASA, but never did. My first assignment involved building and testing large computer programs that could analyze the three-dimensional, supersonic flows through high speed aircraft inlets. This area of research is called Computational Fluid Dynamics (CFD) and allowed me to use both my academic and my military experiences. We were particularly interested in the flow through a rectangular inlet for hypersonic flight. We discovered some interesting three dimensional flow problems associated with this type of inlet. Based on my inlet work, I was assigned to the National Aerospace Plane (NASP) project to develop a vehicle that would take off like an airplane and fly into low Earth orbit. There were many technical meetings on that project and I had to travel around the country to work with fellow CFD and high speed inlet people in government and industry. I was appointed to an AGARD (NATO) working group on inlets that required several trips to Europe to work with British, German, French, and Italian researchers. Meanwhile, a group of us at Lewis began a CFD project to build a well documented, easily modifiable computer program. Ideas from this program were used in several other projects at that time. In the early 1990's, I decided to give management a try, but after a year, I found that I didn't like management. So I returned to the technical world but in a slightly different area. I worked for several years using CFD on space experiments. One of the experiments was flown on the Space Shuttle to test methods for moving fluids in microgravity. The CFD programs that I used at that time were "batch" programs that ran on a large mainframe for many hours. But I was becoming more interested in interactive programs like the video games my son played at home. 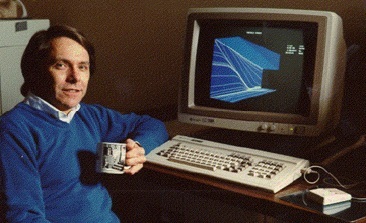 With an interactive program the user changes some input using a special device, the program computes a new result, and then presents the answer immediately using computer graphics. I wanted to research the use of this kind of technology to study fluid mechanics problems. As I began to test an interactive design program, it occurred to me that the program could be better used as an educational tool. So I started to build small, interactive computer programs for college students to learn the basics of aerodynamics. The programs were designed to look and act like an experimental wind tunnel, but they would run on a desktop computer or laptop. Several of the programs have now been modified for high school and middle school students. To distribute the programs and the backgound information and equations used in the programs, we turned to the Internet. I began to write an on-line textbook called the "Beginner's Guide to Aeronautics". For the last 15 years I have split my time at NASA between inlet and nozzle aerodynamics and work with Glenn's Educational Programs Office. 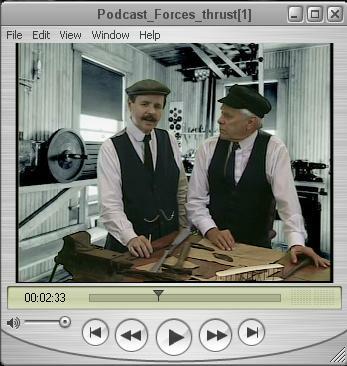 During the early 2000's we built a special section of the Beginner's Guide to tell the scientific story of the Wright Brothers and the invention of the airplane. As part of that telling, Roger Storm and I don bowlers and hard collars and present the story as Wilbur and Orville. We have travelled the country over the last dozen years and are particularly proud of being invited to Dayton to speak at Wright Brothers Day with the Wright family. One of the interactive computer programs is a simulation of the flight of a baseball. The forces on a baseball in flight are exactly the same as the forces on an aircraft, except for the thrust. 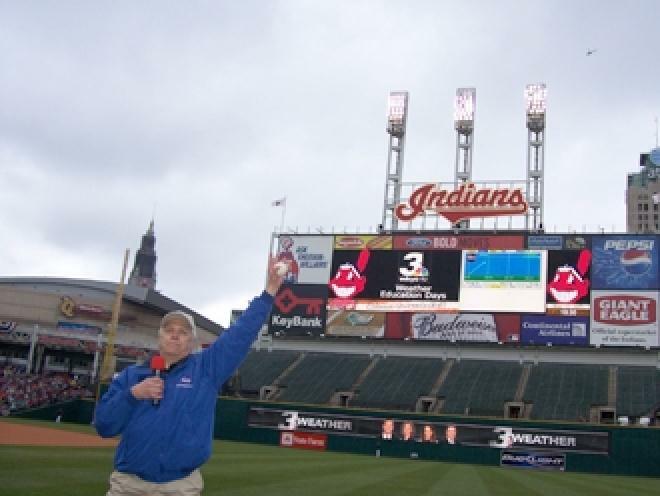 Because of interest in the baseball simulation, I have appeared on the Major League Baseball Network broadcast, have had discussions with former major league players, have given talks at Progressive Field for the Cleveland Indians, and got to throw out the first pitch at a major league game. Educational outreach has lead to frequent participation in videoconferencing with students of all ages. In 2012, I was invited to give a TED talk on creativity at TEDxCLE. As part of educational outreach, I have been asked to appear at many activities over the last dozen years. I spent two weeks in Washington DC as part of the Smithsonian Folklife Festival in 2008 demonstrating a small wind tunnel on the National Mall. 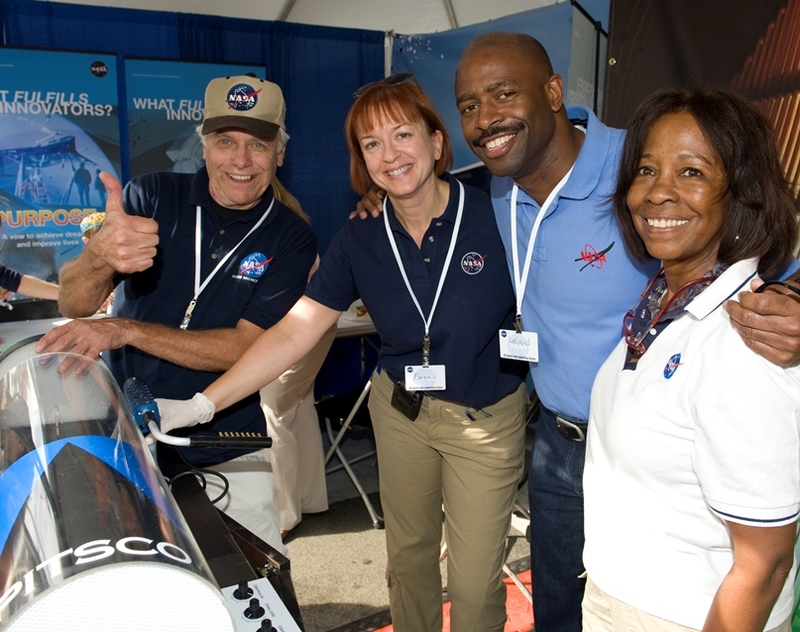 I also worked at the NASA exhibit during the first two USA Science and Engineering Festivals in DC. In 2003 NASA invited educators to apply to become astronauts. The last 200 people in the selection process were designated as the Network of Educator Astronaut Teachers (NEAT). Beginning in the summer of 2005, and for the following 5 years, I was asked to work with the NEAT teachers in the NASA Glenn region. Each summer we would have a week long workshop at which we would brief them on NASA missions for the coming year so that they could carry this information back to their schools and students. They are a group of outstanding math and science teachers, and it has been my honor to work with them and to get to know them as friends. 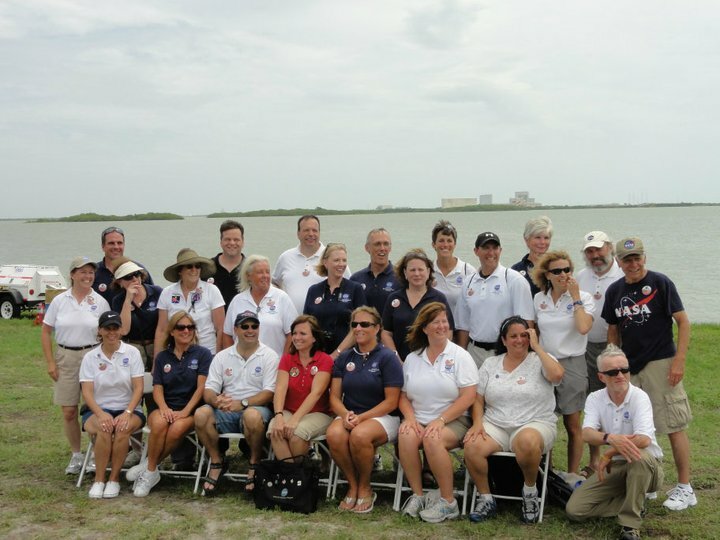 In 2011, we were all invited to view the last launch of the Space Shuttle (STS-135) from the NASA Causeway at the Kennedy Space Center. I have three grown children and three grand-children. Unfortunately, none of them live in the Cleveland area. Like many engineers and scientists, I have a love for music. I sing in the church choir every Sunday. I also belong to group that sings Gregorian Chant. I play guitar at church and have played bass guitar in a garage band and a roots music band here at NASA. Being from Columbus, I'm an avid OSU and Cleveland Browns football fan. I belong to a health club and try to stay physically fit. For many years, I used to ride a bicycle to work. That stopped when I broke my collar bone in a slip on ice riding in the dead of winter. I like math puzzles and video games and have beaten most of the Zelda games (still working on Skyward Sword).